During my last pilgrimage to Manoppello after concluding my studies in Rome and before returning to the United States of America, Paul Badde and Father Carmine Cucinelli, O.F.M. Cap, rector of the Shrine of the Holy Face, both referred to me as "an apostle of the Holy Face" because of my collaboration with them in researching the history of the Volto Santo and my desire to make the Face of Jesus more well known. 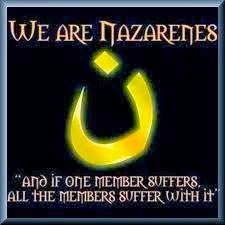 I do not think I am worthy of such a title, but I am happy to do my part in spreading this beautiful devotion. 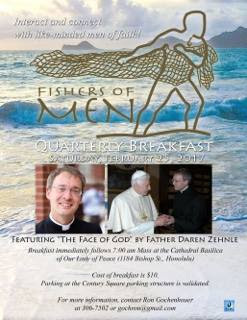 Since my return to Illinois, I have had the opportunity to talk about the Holy Face with the Sisters of St. Francis of the Martyr St. George and soon I will have the pleasure of talking about the Volto Santo with the Fisher's of Men in Honolulu at 7:00 a.m. on Saturday, February 25 at the Cathedral Basilica of Our Lady of Peace. If you are on one of the Hawaiian islands, I hope you'll be able to join us for the breakfast and talk and humbly ask that you help spread the word. Mahalo e aloha! I am so jealous! However, I will set aside my envy and pray for a blessed and fruitful trip to Hawaii for you. You truly are an "apostle of the Holy Face" and a very knowledgeable one at that! I hope maybe later you will post some of your talk to the men's group...they are very lucky! Enjoy the Aloha!